If someone told me I had to choose between lemon and chocolate desserts, I would have a hard time with that answer. I love all things lemon. This dessert is perfect for any fellow lemon lovers. It is not to be confused with the lemon yogurt cake I posted about awhile back. They are completely different, although, both delicious. The dessert was fabulous. I really don’t know why it is called a pudding cake because there is no pudding involved. I would compare it to soufflé. It separates into layers so that the top is cake-like and the bottom is a smooth sauce. I thought it tasted like lemon meringue pie on the second day, if that makes any sense. I followed this recipe exactly as well as the tips given in the post. 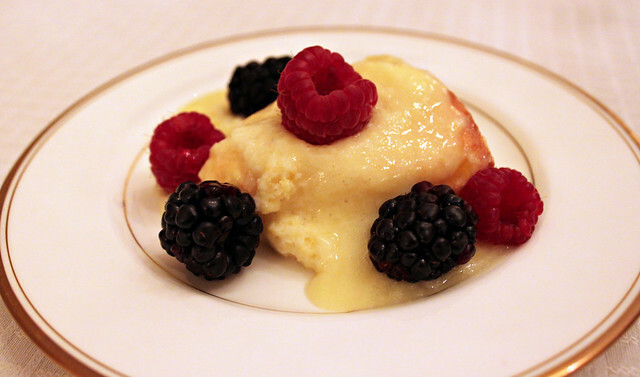 The Perfect Pairing for lemon pudding cake is a topping of fresh berries. The combination is light and delicious. I will definitely be making this again!